Chiang Mai Guide: Where to Eat, Sleep, and Explore! 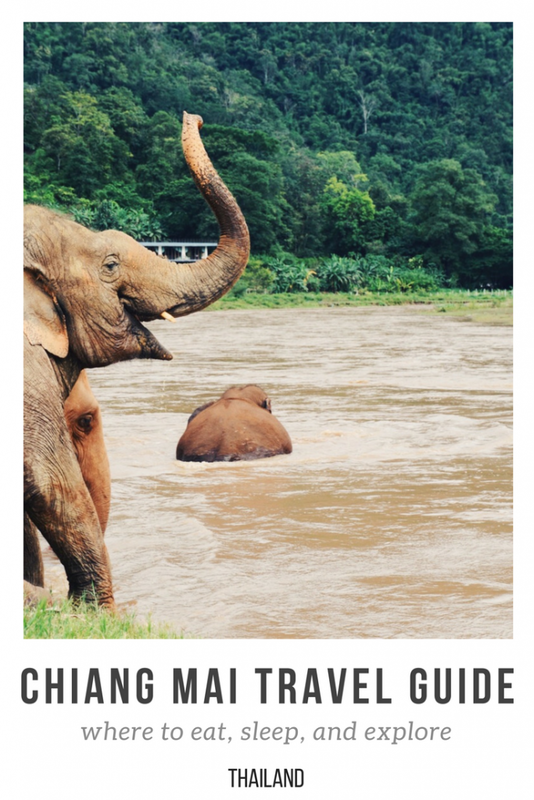 The Only Chiang Mai Guide You’ll Ever Need! Chiang Mai is filled with fun food markets. Here you will find a selection of local dishes at cheap prices! The market located at Chiang Mai Gate is one of my favorites! There is a large selection of stalls available, catering to the needs to vegetarians and vegans as well! 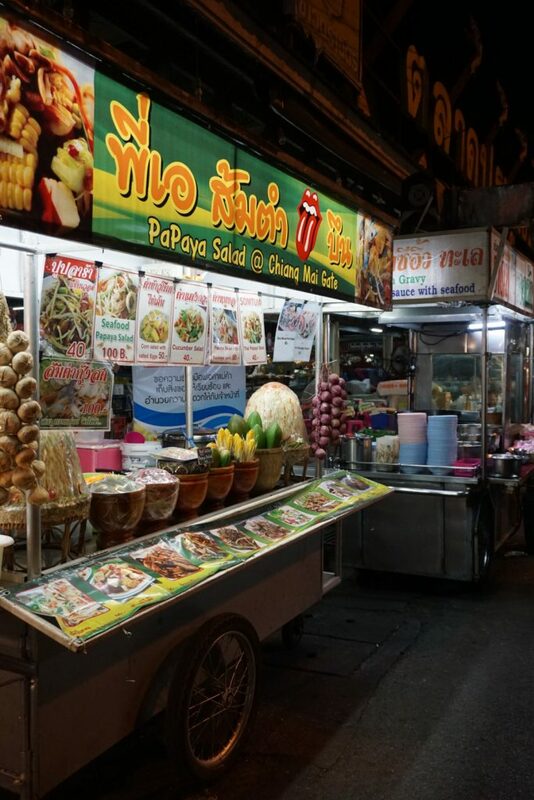 Check out the Papaya Salad @ Chiang Mai Gate stand for the most incredible cucumber salad! 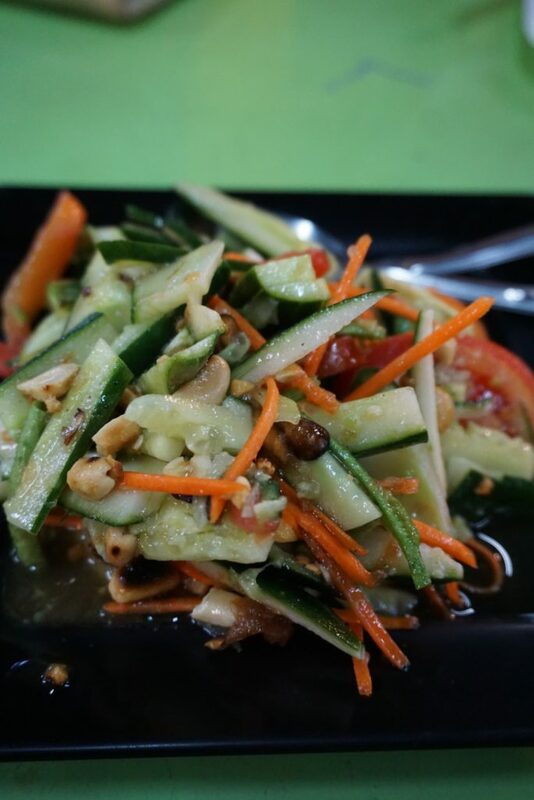 Priced at 50 Baht for a large serving, this salad is healthy, fresh, and full of flavor! If you happen to be in the area in the morning you will find a fresh fruit market! However, the evening vendors start setting up around 5pm. 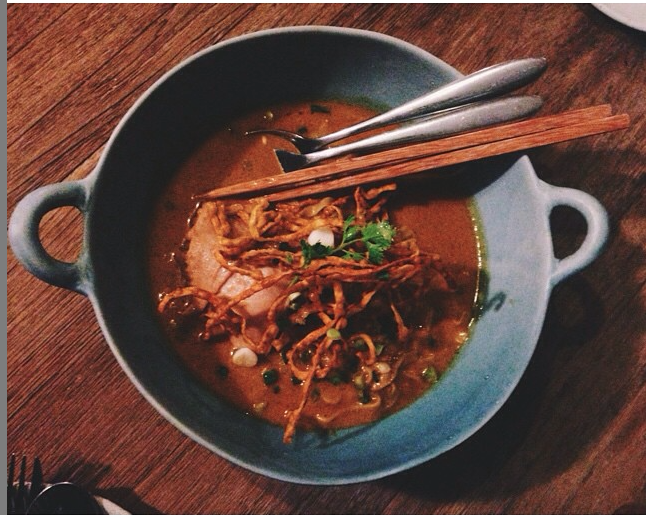 Khao Soi is one of Chiang Mai’s traditional dishes. Khao Soi is a soup-like curry dish filled with both boiled and deep fried egg noodles, as well as a meat of your choice. The dish is topped with shallots, limes, greens, and chilis. 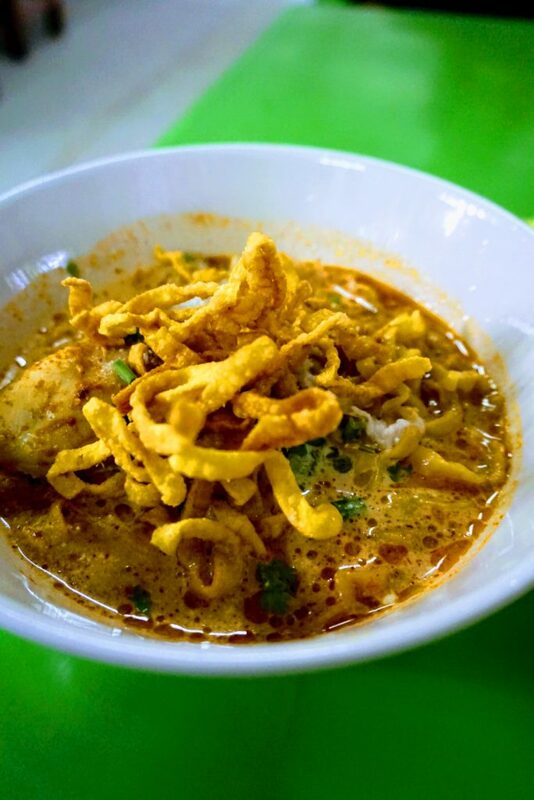 Khao Soi Lam Duan is a super local spot where you can get an authentic taste for this flavorful dish. Prices start at 40 Baht a bowl. You can walk here from the Old Town in about 25-30 mins or hop in a tuk tuk for around 100 baht. While this spot is not your traditional Thai locale, it definitely deserves a mention in my opinion. Located in the art district, the cafe itself is like an art instillation. Every inch of the cafe is adorable, with flowers, paintings, and homemade cakes and desserts decorating the premises. The menu offers a wide selection of both Thai and Western dishes at moderate prices. Expect to pay around 200 Baht for an entree. Make sure to check out the upstairs art gallery and the gift shop! This is your no-frills Thai restaurant located right in the Old Town. If you followed along on my recent adventures though Asia you’ll know that I love finding cheap, authentic food! Entrees range from 40-70 Baht and are full of flavor! My personal favorite is the Chicken Stir Fry with Roasted Chili Paste. This is a must on any Chiang Mai Guide! Every so often you crave some Western food abroad. Good Morning Chiang Mai is your go-to for a great omelette and strong WiFi. Perfect for digital nomads looking for a nice spot to work. Chiang Mai’s Old Town has tons to offer! Walking through the old town you will find plenty of temples, eateries, and massage parlors. I would suggest spending at least a day simply wandering within the Old Town walls. Make sure to either dress appropriately or bring along something to cover up, as you will need to have your shoulders and knees covered to enter any of the temples. 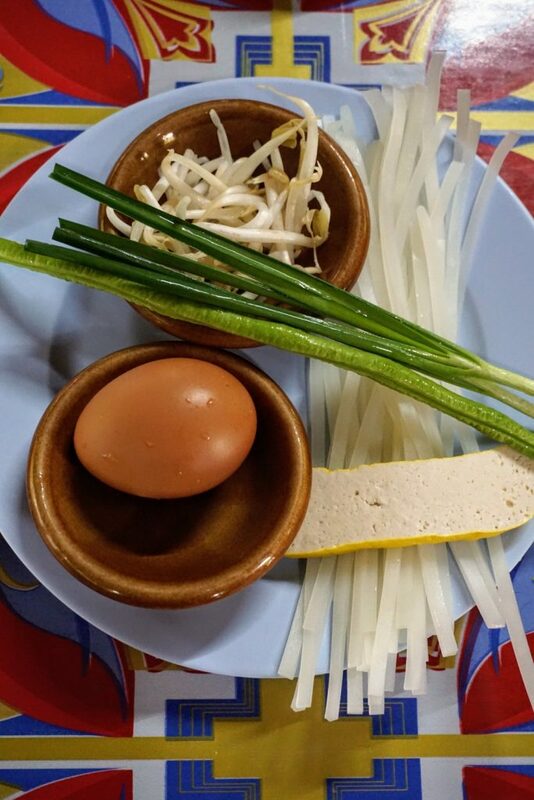 Taking a cooking class in Thailand is a must! While Chiang Mai does have an abundance of cooking schools, I have personally attended the class at Siam Rice Cookery and couldn’t be more pleased. 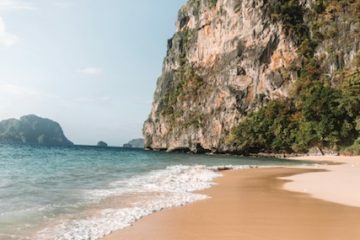 For $29 USD for a full day course you will receive hotel pick up/drop off, a tour of the local market, a selection of seven dishes to cook, and a cookbook and certificate of completion to take home. This class is suitable for all levels and will definitely make you feel like you’re ready to get sign up for the next season of Master Chef. For more information check out my blog post on Siam Rice Cookery School here! Located just across the river from Chiang Mai’s Old Town you’ll find an area full of quaint art galleries, boutique shops, and adorable cafes. Take a stroll in this area to experience a different side of Chiang Mai. This temple is located right outside of Chiang Mai up a (very) windy mountain road. The large red tuk-tuks head up the mountain and can fit at least 8 people in them! The entire tuk-tuk shouldn’t cost more than 500 THB ($16), so the more passengers the better. Across from Hug Hostel (right in front of the 7/11) you’ll find a bunch of tuk-tuks heading up that way so feel free to hop in one of those! Once you’re dropped off you’ll have a quick climb up some gorgeous steps before arriving at the temple. Entrance tickets cost only 30 THB (less than $1). As this is an active temple it is important to make sure that you have your shoulders and knees covered. Daily Night Market – Chiang Mai has a incredible Night Market street comprised of a series of both indoor and outdoor shopping areas. My personal favorite is Anusarn Market where in addition to fun handmade goods and souvenirs, you’ll find some great dinner options and a cheap massage! Saturday Night Market – Not quite as large as the Sunday Market, this weekly Saturday market is still a great bet for some shopping! You’ll find areas off to the side reserved for street vendors as well! Sunday Walking Street – this market is not only my favorite in Chiang Mai, it might just be my favorite in all of Thailand! If you can find a way to be in Chiang Mai on a Sunday then do it! The market opens in the afternoon and stretches from one end of the Old Town to the other. 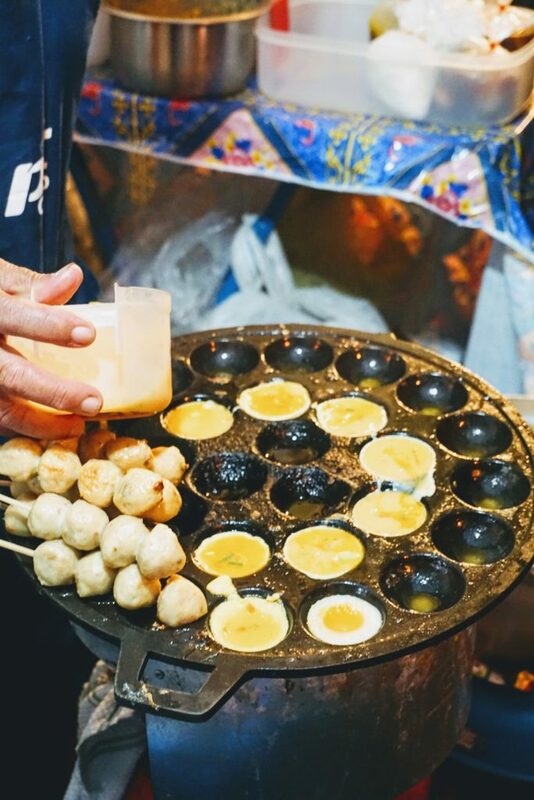 You’ll find endless streets of local goods and AMAZING street food! My favorite part is getting to try all of the different food options along the way – gotta keep up your energy when you’re shopping. I am going to go ahead and count this an activity as well since my time in Thailand (and in life in general) revolves around food! In addition to some of the restaurants mentioned earlier, make sure that you are eating from all of the amazing food stalls! Don’t forget about dessert – some of my favorite dishes include the mango with sticky rice and nutella banana roti! This spot is average in price and decor, and that’s it! The massages here are absolutely fantastic! This massage spot is a great option for a no-frills, cheap massage! You definitely won’t be pampered but the massage will be amazing (especially for the price)! I was unable to find a name for this massage, however you will find it centrally located in the Anusarn Market. There are reclining chairs set up so that you can enjoy your massage without missing out on the action of the night market! If you’re lucky there might even be some live music going on at the nearby bar. 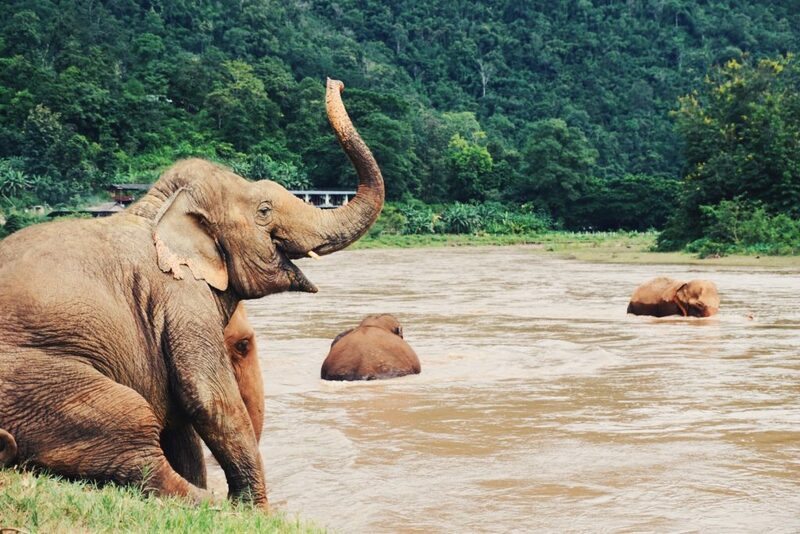 Seeing elephants is definitely one of Northern Thailand’s highlights. There are many camps to choose from, however some of definitely more ethical than the others. 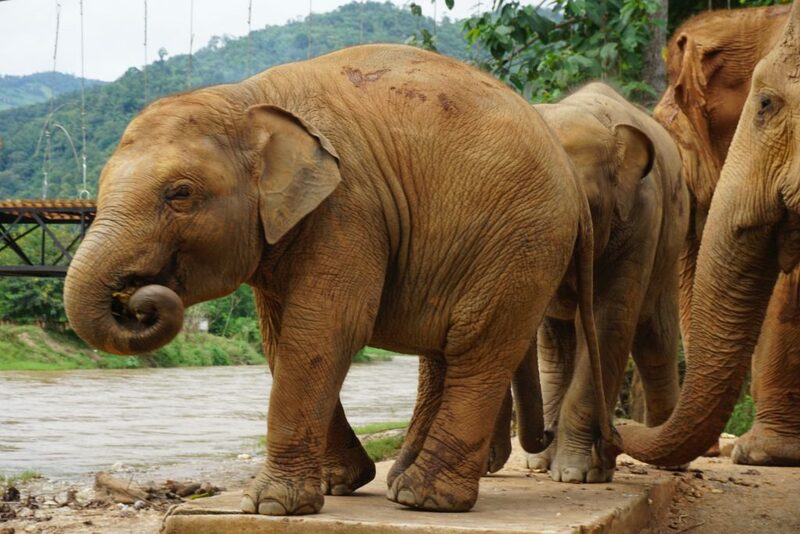 If you do not want to ride at all, then I recommend checking out Elephant Nature Park. Although it is a bit touristy, ENP is a great place to get up close to the elephants in a humane no-riding environment. If you wish to ride the elephants then my best recommendation would be to check out Baan Chang. This is considered to be one of the most humane of the riding camps. It is definitely on the pricier end, however a portion of their proceeds go to elephant rescue. 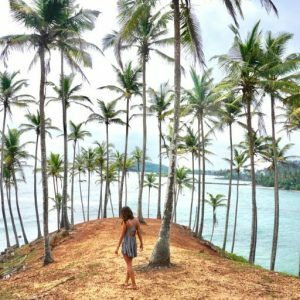 Looking for a beautiful, cozy spot to kick back on a backpacker’s budget? Haus Hostel is the option for you! I have stayed here on multiple occasions and have always been beyond pleased! The hostel currently offers 4, 6, and 8 bed dorm rooms, with both mixed and female-only options available. Each bed is equipped with a personal reading light, charging outlet, privacy curtain, and large storage locker. Located just South of the Chiang Mai Old Town walls, Haus Hostel is the perfect base for visiting all that Chiang Mai has to offer! In just a few minutes walking you can reach a number of restaurants, street food markets, and local attractions. A few nearby highlights include Chiang Mai Old Town, Wualai Saturday Night Market, and the Chiang Mai Gate Food Market. Futhermore, the local staff is extremely helpful and accommodating for your various travel needs. For a full review check out my post exclusively on Haus Hostel here! If you’re looking for an affordable hostel with a bit more of a party, social scene – look no further than Hug Hostel. This is a great place for solo travelers looking With rooms starting as low as 180 THB/ night, its a hard price to beat. While breakfast is not included in the rate, they have a cafe on-site with affordable prices! They’ve also just opened up a second branch that I can’t wait to check out on my next visit! Looking to stick to a budget but dorm rooms not your thing? This hotel is a great option for those looking for a little privacy. The rooms are clean, breakfast is included, and the pool adds a nice touch! 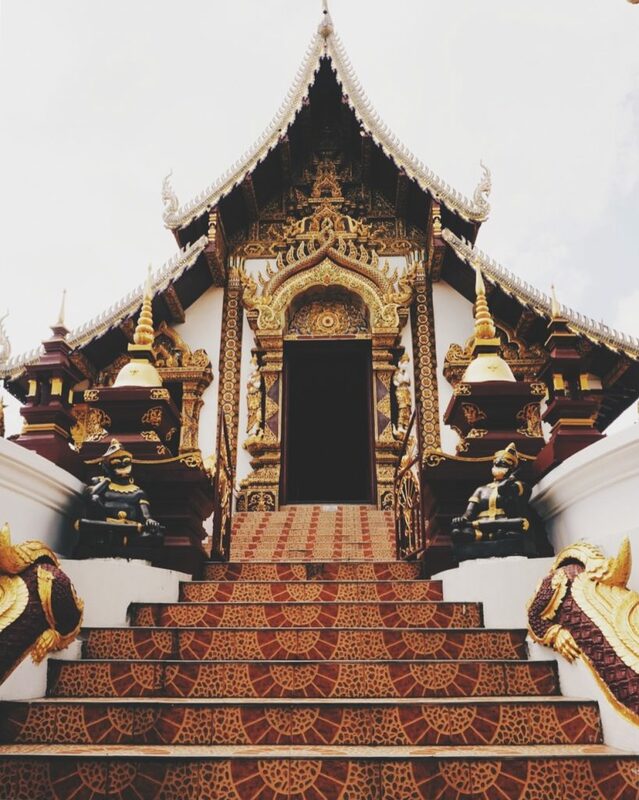 Located just down the road from Haus Hostel, you’ll have no problem reaching Chiang Mai’s best spots! Check out their website here for more info! This option is great for couples, families, or those simply looking for something a bit nicer, still without breaking the budget! 99 The Gallery is a boutique hotel right in the heart of Chiang Mai’s Old Town. Here you’ll find an amazing breakfast buffet, a quaint swimming pool, and excellent customer service. Rooms start at around 1100 THB (depending on the season). Like this Chiang Mai Guide? Don’t forget to pin it! 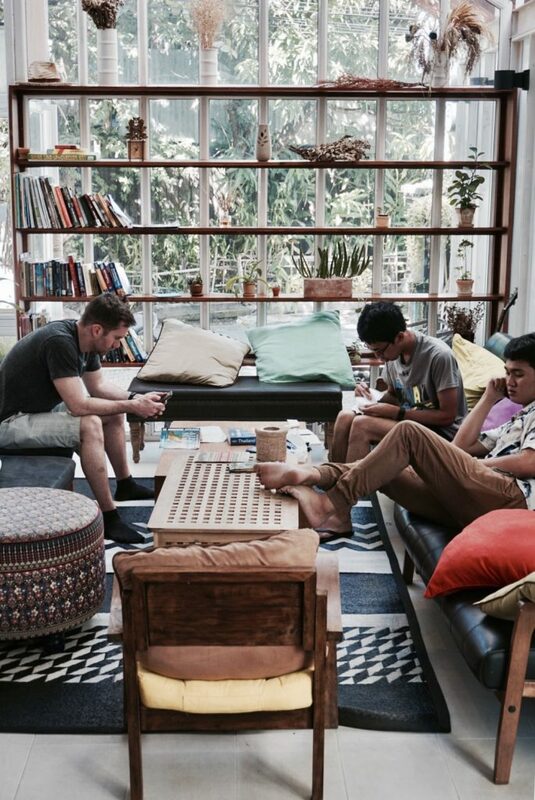 A review of Chiang Mai's coziest hostel: Haus Hostel!